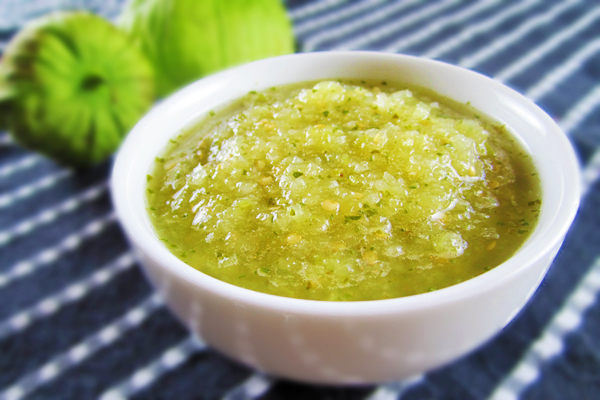 I scream, you scream, we all scream for…salsa verde! Ay ay ay! I know I’m not the only one who gets excited over salsa verde whenever I go to a Mexican restaurant. Tangy, fresh, and a little zesty…how can you resist?! If you love salsa verde, thank the “little tomatoes” called tomatillos. I was first introduced to these small, green fruits covered in paper-thin husks when I made chicken enchiladas verdes. After instantly falling in love with these cute lil’ fruits, I incorporated them into recipes other than typical Mexican dishes. Trust me, there’s nothing like topping a chipotle pork burger with a crisp tomatillo slice! Ready to learn the way of the tomatillo? When to Buy: Tomatillos are in season from May through November, but the best time to buy them is when they peak in August (so get ‘em now while they’re hot!). What to Buy: When buying tomatillos, examine the husks first. They should look fresh—not shriveled—and have a green or light brown color. 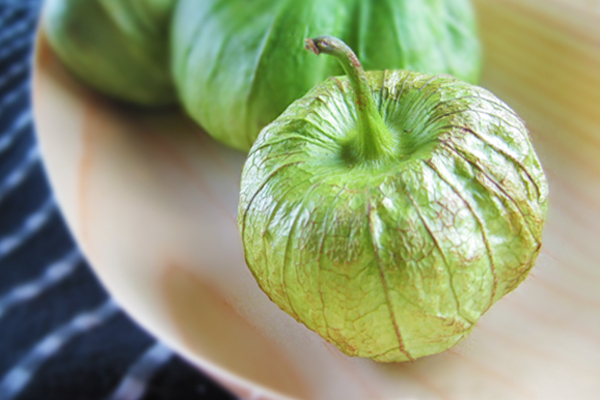 The tomatillo fruit itself should be firm, smooth, and green. Although the green color indicates unripeness, tomatillos taste their best in the green stage of their maturity. While yellow tomatillos are okay to use, they are not as flavorful as green tomatillos. When it comes to the size of the tomatillo, the rule of thumb is: the smaller, the sweeter. Prep & Storage: Keep the tomatillos in their husks until you’re ready to use them. In the meantime, refrigerate the tomatillos in a plastic bag for up to two weeks. When you’re ready to use them, pull off the husks, rinse the tomatillo fruit under cold water to remove the sticky coating and dry well. How to Cook: The way you cook your tomatillos will depend on the flavor you want to achieve. If you want to taste the full citrus flavor of the tomatillos, eat them raw! Can’t handle the flavor? Mellow it out by blanching the tomatillos in boiling water until they soften. But, if you really want to experience tomatillos at their best, roast your tomatillos under a broiler or over an open flame to achieve a smoky flavor (this is my favorite way to cook them!). Seared Scallops with Tomatillo Guacamole and Corn Salsa. Yum. Need I say anything to convince you to make these for dinner tonight? With that being said, tomatillos go with any kind of seafood. Try them with, say, Baked Shrimp. Chipotle Pork Cheeseburgers topped with muenster cheese, avocado and a tomatillo slice are definitely the new (and tastier!) burgers in town. Watch out, all-American beef burgers! Tomatillo Dressing will add a new kick to any summer salad. 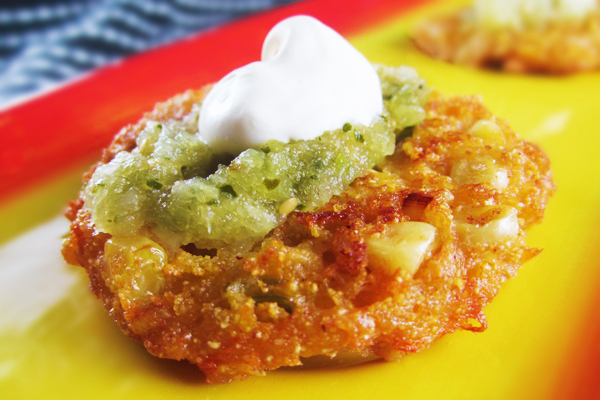 And if you’re not sure where to start, try these Corn Cakes with Tomatillo Salsa. But don’t be fooled by their simplicity…they are definitely appetizers that will impress any crowd. For the tomatillo salsa, preheat broiler on high. Place tomatillos on a baking sheet and broil until softened, about 10 minutes. Allow them to cool. Put the tomatillos, jalapeño, lime juice, cilantro and onion in a blender or food processor with a generous pinch of salt. Purée, and then pour into a serving bowl. Chill in the refrigerator until ready to serve with the corn cakes. For the corn cakes, combine the cornmeal, baking soda, paprika, and 1/8 teaspoon salt in a bowl. Whisk in the buttermilk until smooth, and then fold in the cheese, scallions, corn kernels, tortilla chips and eggs until a chunky batter forms. Preheat an inch of olive oil (or vegetable oil) in a cast iron skillet. Use a spoon to scoop out balls of batter (about 2 tablespoons each) and carefully drop into the oil. Let them fry until golden brown, about 2-3 minutes per side. Serve with tomatillo salsa and top with a dollop of sour cream. Categories: Budget, Campus Cooking, Featured, Just Recipes, Recipes, and Snacktime. Yum! I need to try this one out. How long to you think it would keep? I’m assuming you’d be able to freeze or can it.